I’m not adopted nor am I an adoptive parent, but it’s a topic near my heart. Partly because I care deeply about helping children and partly because adoption is how God describes His process of making us His children. 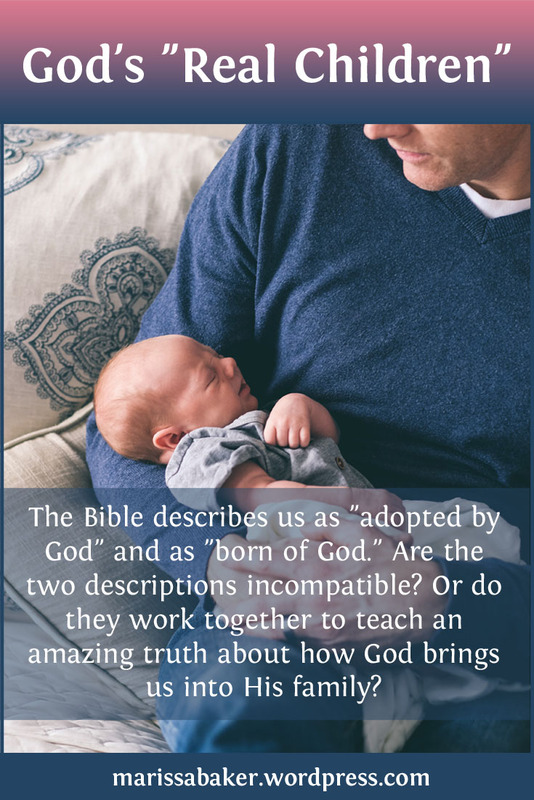 As you might imagine, I’ve got a couple issues with the idea that teaching we’re adopted by God is the same as saying we’re not His “real children.” For one thing, it implies in way that’s not at all subtle that if you’re adopted you’re not really part of the family. And it’s not okay to say things like that to an audience that very likely includes adopted children (and if it doesn’t, it should. The Bible defines true religion as caring for orphans and there are 3 times as many churches as orphans in the U.S.). But as vital as it is to make sure our words don’t injure others, it’s also important to properly represent God’s teachings through scripture. The word translated “adoption” in New Covenant writings is huiothesia (G5206). It’s a compound formed from the words huios (“son” G5207) and tithemi (“to place” G5087). Paul’s the only Biblical writer to use it and it’s not found in classical Greek either (though the phrase thetos huios is used for “adopted son”). Rather, it’s a technical term referring to a legal and social custom in Greek and Roman society. This sort of “adoption, when thus legally performed, put a man in every respect in the position of a son by birth to him who had adopted him, so that he possessed the same rights and owed the same obligations” (Spiros Zodhiates The Complete WordStudy Dictionary, entry on G5206). While it can be translated “sonship,” it’s a sonship obtained through an adoption process (not sonship instead of adoption). Paul uses huiothesia five times, three in Romans. In the chapters leading up to the first use of this word, Paul has been talking about our need for redemption. All of us fell short of God’s standards, alienating ourselves from Him, and were once enslaved to sin. But because of Jesus’ sacrifice, we’re set free and given the ability to walk in the spirit. We don’t have to live apart from God any more. Adoption is how Paul describes the process by which we become God’s children (see also Eph. 1:5). Later, he uses the same word saying we’re “waiting for adoption, the redemption of our body” (Rom. 8:23, WEB). So it’s not just used of what’s happening now, but also of our change to spirit beings at Christ’s return. The link between adoption and redemption is also found in Galatians 4:5, when Paul says we’re redeemed so that we can be adopted and that God puts His spirit in our hearts after our adoption. When God puts His spirit in us, we start a process John (and Peter in one verse) describe as being born or begotten by God. In Greek, the word is gennao (G1080) or a derivative. As with Paul’s discussions of adoption and redemption, being born again/begotten by God is described as something that’s happening to us right now and will happen in the future. John talks about God’s seed of begettal being in us now and says “everyone who practices righteousness has been born of him” (1 John 2:29; 3:9). If you read the whole letter, it’s a fascinating discussion of the way this begettal transforms us and the responsibilities we now have as God’s children. And Jesus also talks about being born again, or born of the spirit, in a conversation recorded in John’s gospel. He describes this new birth as essential for entering the kingdom of God. It’s a process that starts when God gives us His spirit and culminates when we’re turned into spirit beings (John 3:5-8, see also 1 Cor. 15:35-58). It is these passages that people are focused on when they say we’re God’s “real children.” Because the analogy of begetting and birthing is used, they say we can’t actually be adopted. But this is basically just deciding we’re going to base our theology on John’s writings instead of Paul’s. If we’re going to say the Bible is all inspired by God, then we need to accept both author’s writings. John and Paul use different analogies to describe the same process. Both are equally valuable and necessary for a full picture of how God makes us part of His family. It is adoption because God is taking people who were not in His family and making them His children. We were once “alienated from the commonwealth of Israel, and strangers from the covenants of the promise” (Eph. 2:12, WEB). But Jesus promised, “I will not leave you orphans” and “now in Christ Jesus you who once were far off are made near in the blood of Christ” (John 14:18; Eph. 2:13, WEB). As a physical descendant of Abraham, Israel, and David, Jesus was heir to all the major covenants made in the Old Testament. And as the only human being who never sinned, He’s the only one who actually inherited all the promises. He then “willed” those promises to us, making us joint-heirs with Him (see my post “Inheriting Covenants”). Because of Jesus’ life, death, and work, we can be adopted into God’s family as His real children born-again into a new life. Our adoption puts us in the position of co-inheritors with Jesus and starts the process of fully birthing us into God’s family. 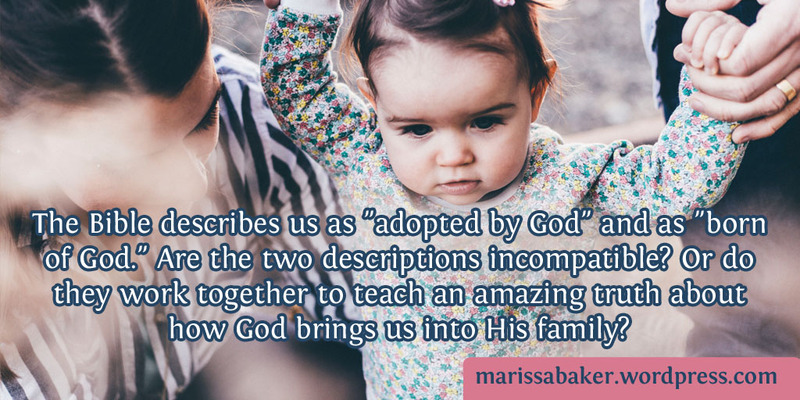 It’s not a question of “adopted children” versus “real born-again children.” We’re both because God’s is taking us from being orphaned and outside the family into a child-parent relationship with Him that will last for eternity.